Without the backing of an employer-sponsored retirement account, many gig workers are not saving enough for their golden years. 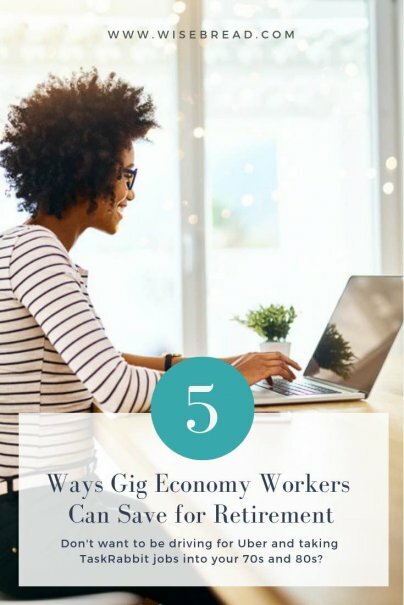 According to a recent report by Betterment, seven out of 10 full-time gig workers say they are unprepared to maintain their current lifestyle during retirement, while three out of 10 say they don't regularly set aside any money for retirement. Many people don't have a clear idea of how much money they have. And it's impossible to plan your retirement if you don't know where you are today. So any retirement savings should start with a look at what you already have in the accounts in your name. Add up how much is in your checking and savings accounts, any neglected retirement accounts you may have picked up from previous traditional jobs, cash on hand if your gig work relies on cash tips, or any other financial accounts. The sum total could add up to more than you realize if you haven't recently taken stock of where you are. If you don't already have a retirement account that you can contribute to, then you need to set one up ASAP. You can't save for retirement if you don't have an account to put money in. While no investor wants to lose portfolio growth to fees, it's especially important for gig workers to choose asset allocations that will minimize investment fees. That's because gig workers are likely to have less money to invest, so every dollar needs to be working hard for them. To start, set up an automatic transfer of an amount of money you will not miss. Whether you can spare $50 per week or $5 per month, having a small amount of money quietly moving into your IRA gives you a little cushion that you don't have to think about. From there, consider using a savings app to handle retirement savings for you. For instance, Digit will analyze your checking account's inflow and outflow, and will determine an amount that is safe to save without triggering an overdraft, and automatically move that amount into a savings account. You can then transfer your Digit savings into your retirement account. An excellent way to make sure you're maxing out your contributions each year is to change your view of "found money." For instance, if you receive a birthday check from your grandmother, only spend half of it and put the rest in your retirement account. Similarly, if you receive a tax refund (which is a little less likely if you're a gig worker paying quarterly estimated taxes), send at least half of the refund toward your retirement.